Promotional Sewing Kits to Sew up your Path to Success! 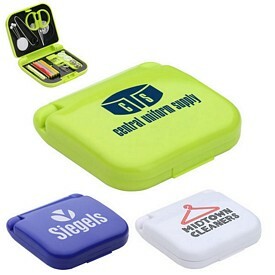 Promotional sewing kits customized with your business logo can easily help advertising for your company. 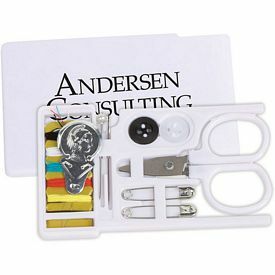 Sew Handy Deluxe sewing kits contain scissors, two safety pins, needle threader, cloth measuring tape, four buttons, four needles, and ten colors of thread. The sleek custom compact case comes with a zipper closure. We use screen printing to put your company logo on the branded sewing kits. You can get the logoed sewing kits in colors like lime green, red, royal blue, or black and have black trim. We produce the promotional sewing kits with free 24 hour rush service. 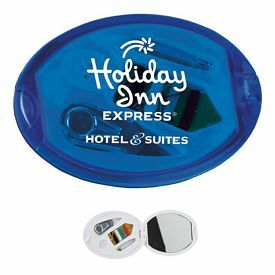 The promotional budget pre-threaded fold up Sewing kits are personalized sewing kits for customers who travel a lot. 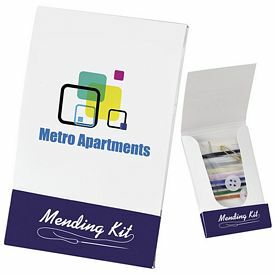 The customized pre-threaded fold up sewing kits are useful for the promotion of hotels and spas. 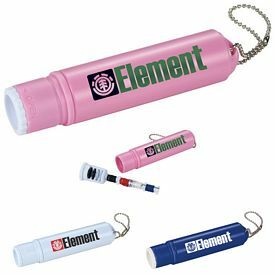 There are three pre-threaded needles in white, black, and navy color, so customers can save additional time. Two black buttons and two neutral buttons come along with the sewing kits. There are two safety pins. 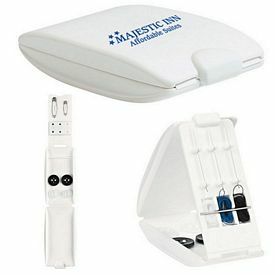 The Snap closure makes sure that the needles or the buttons are always secure in the case. We will do a free one color logo imprint on the white case. A free artwork eproof will be done without any set up fees. 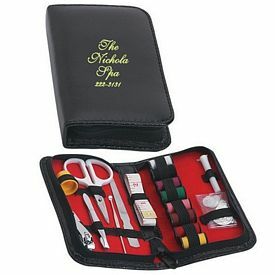 The custom multipurpose sewing kits and custom manicure kits with cases are effective promotional sewing kits. 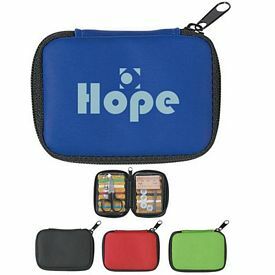 The promotional case is made of elegant leatherette with zipper closure. 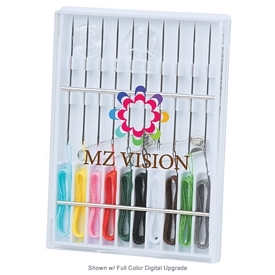 The logoed kit consists of various essential items like eight spools of thread, needle threader, five needles in a tube, two safety pins, four buttons, cloth measuring tape, stainless steel nail file, cuticle pusher, tweezers, scissors, and nail clipper. Screen printing will be done on the black case so customers can recognize your brand instantly. Free 24 hour rush service is available on the promotional sewing kits. 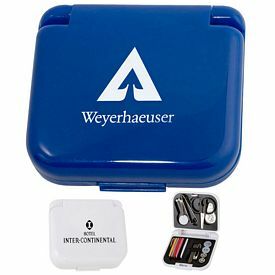 Travel agencies can endorse their companies with the customized traveler pre-threaded sewing kit. 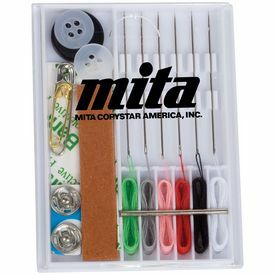 The promotional sewing kits are ideal for fashion industries and for customers who need a quick sew. 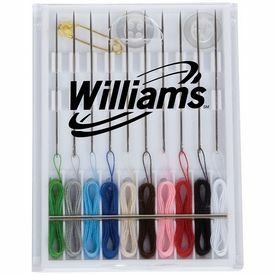 The custom sewing kit includes ten pre-threaded strands, two buttons and two safety pins. 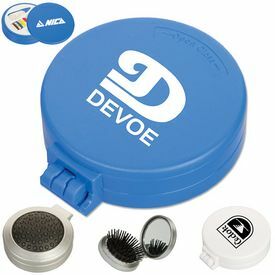 Your logo is pad printed on the top surface or on the back of the sewing kits. 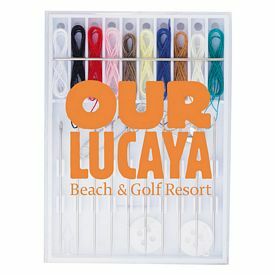 Available colors are translucent in blue, lime, purple, red, and solid white. We recommend that you opt for white ink for the company logo as it will give the best visibility. We do not charge any setup fees. We will do a free one color logo imprint and free artwork eproof. There is a free 48 hour rush service on the personalized sewing kits. 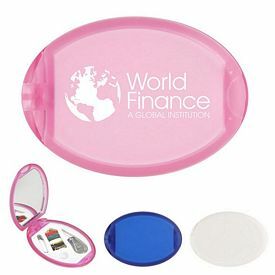 The branded See N' Sew sewing kits work as sewing kits as well as pocket mirrors. 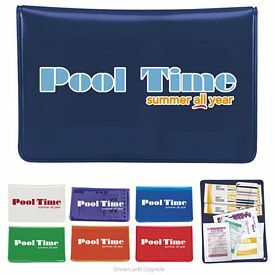 The promo sewing kits have a large oval imprint area for multi-colored imprint. You can get the promotional sewing kits in white, blue or black color. Another variation of the same designs are the custom Pocket mirror sewing kits. 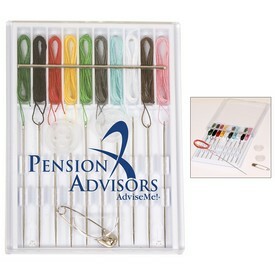 The promotional sewing kits include multi-color threads, button, needle, threader and a safety pin. 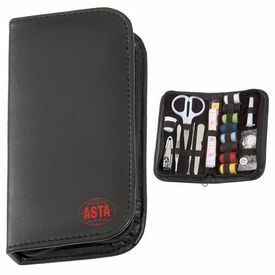 The logoed Sew n Aid Traveler kit is ideal for traveling. 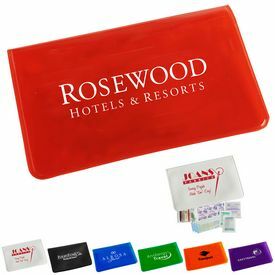 The promo travel case includes a sewing kit, free vinyl bandages, adhesive pad, antiseptic towlette, antacid packet, and ibuprofen packet.